The second book in the Wayward Pines series, Ethan Burke is now the sheriff of the mysterious Wayward Pines. Wayward Pines seems to be like any other town, except without the possibility of leaving. No one knows how they got there. No one knows how to leave. Every bit of their lives are planned out for them by someone else, someone who decides where they work, what they do, who they marry. More importantly no one knows what lies beyond the town. Except for Ethan Burke. He’s one of the few who knows what lies beyond the town. He knows the truth, and it’s his job to keep the citizens of his town safe from it. But can he really do that? These books are just so good. Some people have said they don’t like the writing style, but I think for the pace of the story, it really works. The world that Crouch has created is frightening, and the twists he throws at us, while a little more predictable in this novel, still rather blew me out of the water. All in all an excellent book. Honestly, the only thing I don’t like is that you run through them so quick sometimes it’s hard to remember what they’re about. I had to work to jog my memory. However, that’s more of a personal problem, than a problem with the book itself. I highly recommend this book! Especially if you like mysteries and thrillers. The Earth is intact! And Ford Prefect makes his way toward it. . . Meanwhile, Arthur Dent discovers both love and the last message God left to the universe. I liked the idea of Wonko the Sane, and that somehow the dolphins left Earth. But I’m going to be honest, after the first three books, this one was kind of disappointing. This book really seemed like an afterthought. It was an addition to a “trilogy”, and it felt like it. There was really no point in this book, I felt, and it didn’t further the characters at all. 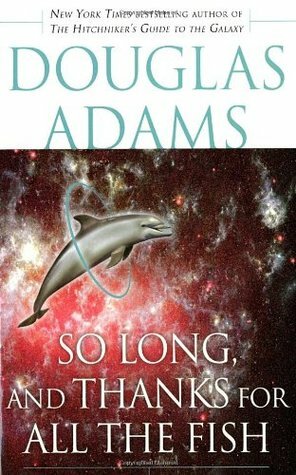 I felt like Douglas Adams had bits of things about Ford and Arthur and Earth, and that’s exactly what this book was. A lot of bits and pieces. Which was disappointing, because I really enjoyed the first three books in this series. This one is really subjective because you may — like me — decide that you’ve spent this long with these characters so you might as well continue on with them. However, there’s not a whole lot going on in this story, not like the previous three, so I would probably skip this one if completing all the books in a series doesn’t matter to you.